Maybe move away from the obsolete antique fixed block signal system sometime over the next century. The way the MTA has handled the transition to CBTC from it’s antique-shop signal system, or rather, the morbid slowness of the transition, is annoying. The fact that over the past century the only progress that was made is ATS on the IRT (which doesn’t really do anything regarding delays) and one CBTC line with the L is appalling. CBTC however is not only very expensive but not proven when installed in existing century old tunnels. When taking a look at the roll out of CBTC on the L line one must remember that it was plagued with problems and set backs. This is an experiment and one that can’t be taken lightly by testing on the lines that share multiple routes without some level of certainty. The incompetence of the MTA (and the sleaziness of Siemens) aside, CBTC is a pretty good long-term solution. A tunnel being old does not magically make RF go wrong. It is an issue of testing and proper support from the vendors; proper support being something the folks at Siemens AG don’t seem to understand. Hopefully Thales is much more helpful with the Flushing Line CBTC installation and operation. Age has a lot to do with it. Sure Siemens didn’t do the best job but they had too much going in their favor to begin with. The CBTC technology on the subway R143s were from Siemens and the propulsion system belongs to them as well. I guess the best example to show why age is important is this: when you move into an existing house or apartment and your order cable service, the provider comes in to install. They install the wires along the exterior of the walls in either the hall way leading up to your place or around the corners and base boards in your house. The wire is exposed to the conditions of the house such as furniture, kids and possibly foot traffic. This decreases the integrity and the quality of the video as the wire has become compromised by the conditions. And the long the wire is from the compromised point to the TV the worse the feed. When you move into a brand new, newly built house or apt building the wires are built into the walls. No exposure to the conditions. The point of the analogy is to say this. When the line is built from the ground up you play with house money. You can situate your systems in the most optimal positions. Your systems were probably included in the drawing up of the plans in the blue print stage and even better you have the ability to test again and again before revenue service ever begins like on Second Avenue once all is said and done. The L line unfortunately for Siemens had to resume normal service every single Monday morning. You have to position your systems where room is available and the roll out has to be integrated in with the old system until the new is fully rolled out which flaws the new technology. Siemens, however, seems to install much better rail systems at lower prices in Germany )where unionization and taxes are higher). The bottom line is the people of New York City cannot afford to replace the subway signals system at a once every 60 year pace at the price Siemens, Railworks, etc. have been charging for the Canarie Line, ATS, etc. Their other customers can’t either, but they don’t charge as much there. German taxes are probably lower than American taxes. Going by $2.9T of tax in 2005 (federal and state, not sure this counts local) on a $12.6T means 23% of the GDP went to taxes in 2005. In germany, €538.2B/2.4T = .54/2.4 comes to about 22.5%. * They look similar, but keep in mind the USA dumps onerous mandates relating to all kinds of matters on businesses – healthcare being the elephant in the room. Now, none of this is considering adjustments for purchasing power parity and the like, but it still says a lot for how Americans are getting screwed over. Unionization in Germany might not be so different from New York, except the unions are probably more willing to consider their future. * To be fair, I’m not sure I’m capturing local taxes in either case, though in Germany these would probably be limited to inheritance and various administrative and excise taxes. And of course, this is after the Bush tax cuts, but before the Obama tax cuts. Also, Germans don’t regulate municipalities very much, whereas Americans do so heavily. New York gets it from Albany and Washington, plus there is the whole matter of being shaken down to give money to upstate and (mostly) red states that can’t afford their own infrastructure and entitlement systems. I wouldn’t even say the money is going to upstate; the amount the State Senate pays to lard their own pockets is famous. Most of the workers installing CBTC on the L and now on the 7 line are retired signal supervisors. There isn’t a whole lot of US workers around anymore to do this kind of work without very extensive training. To become a signal maintainer the training lasts a year even if you are an experienced electrician. These workers get at least $10 more per hour than a TA signal maintainer and are non-union. So I quess the union part of the equation doesn’t add up to much. Unions in Europe also negotiate contracts on a nation basis and not not individual cities and states. You really can’t sue corporations in Germany? I thought that was limited to criminal liability. IIRC, the theory goes that there is no reason all the other shareholders should suffer because of the actions of an individual. You don’t punish all New Yorkers because somebody mugged somebody else, afterall, and if anything the whole of New York is a victim too. A civil dispute with a corporation would go to an administrative trial, I think. The flipside of this is that, if I remember correctly, the individuals running the corporation who actually commit the crimes and torts are *personally* liable in Germany; none of this “directors and officers insurance” business where the individuals make the stockholders pay for everything they do. Bolwerk – you do realize Germany has universal healthcare right? I’m not sure what you’re driving at, but yes. Germany also presumably doesn’t give out hundred of billions in free money to oil companies and defense contractors. That probably frees up some cash for things like infrastructure. Not to get all political, but that probably gives them the advantage over us of actually being able to afford proper maintenance and system upgrades. Most likely. Either way, I wouldn’t fall for it when right-wing pols point to higher taxes in Europe as evidence that universal care or proper transit is unaffordable. If anything, those things are leading to significant savings for those societies that Americans aren’t enjoying. I used the GDP information from here. That’s 2005 state and federal taxes &div; 2004 GDP for the USA and 2007 German tax receipts &div; 2006 German GDP. CBTC has been proven in old tunnels in London. It’s installed on the Jubilee line which runs in tunnels that opened in 1939 (ok, 80 years old). In addition a CBTC system has been procured and is just starting installation in the 150 year old tunnels of London’s Metropolitan, Circle and District lines. That may be but one must consider the shutdown policy of foreign subway lines as compared to NYC. It’s only done right when the line can be shutdown. Unlike the L where installation took maybe over a year or two if I’m remember correctly even before testing could ever get underway. Not to mention testing was done in sections. 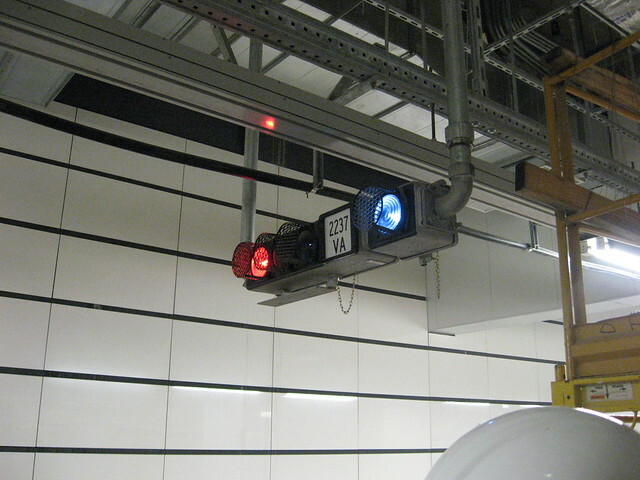 Old tunnel and piecemeal installation connecting new CBTC signals to older installed signal equipment. London did not shut down the Jubilee line while installing the new system, except for a few days at a time. And it’s certainly not going to shut down the entire Met, Circle, and District line congolmeration. Signal systems are replaced as they age. Canarsie was a long, slow start, but hopefully one with lots of lessons learned. Flushing shouldn’t take quite as long, and then much of the IND comes next. I never said ATS is a signal system; I just mentioned it as an improvement. And BTW they still need to work on it, as it gets confused any time a train has to make an unscheduled switch of track. Numerous lines have had their signal systems replaced in the past decades – off the top of my head, the Sea Beach, West End, Jamaica, Astoria, White Plains, Pelham, and Concourse lines have all had their signal systems replaced in the past ~20 years. ATS sets switches automatically based on the schedules, so unscheduled changes naturally confuse the system. Is there a particular issue you’re raising? The unscheduled changes (and the way they affect the countdown timers) are the issue for me. It doesn’t seem to update based on those changes, and trains which get rerouted still remain expected to continue on their scheduled tracks. I’ve seen this at Atlantic and Union Square on the IRT, where after being switched, the display boards still show the train as arriving on the track it was supposed to arrive on, with boards further down the line not displaying the now-switched train. It’s a nit-picky issue, but one that I would hope the MTA and its vendors can fix. Oh, you mean the ATS – PA/CIS interface. Yes, I’ve seen that too, but if ATS isn’t told what’s going on, it can’t pass along useful information. There clearly is a way to tell it what’s going on – I’ve seen 2 trains show up on the boards on Lex – but it probably requires a few minutes of on-the-fly reprogramming. I noticed that the 2 has the most signal problems. As for the sick passengers I hate when they cause delays if they dont feel well then they should not enter the train. Do you wake up in the morning and decide to get sick? I’ve always said that sick passengers should be removed and help summoned to the station. The trains should keep moving. Redeploying the signal maintainers into the hub locations for doing most of the repairs and maintenance on nights is not working out by not having enough signal maintainers checking the system from 6am to 10pm is increasing the troubles and then the response time to fix those troubles. Infrastructure issue will always remain a problem for the MTA… The NYC Subway has the most track mileage (and thereby the most signals) out of all subway systems in the world, and it also happens to be one of the oldest. Plus it’s also got by far the most stations, which means even more maintenance and upkeep. And add to that the fact that we have the most expensive union workers in the world and we can understand MTA’s predicament. For the subway system to be sustainable, they would need to either charge more than every other system in the world to keep up with all the upkeep and we know that isn’t going to happen. You know, I always thought that “Signal Problems” translated to “a light bulb has burned out”. Is the system really so shoddy that the wires suffer more than one break per mile annually? Or is there something else afoot? Old equipment and shoddy old wires prone to water damage from all the non-subway related leaks that get into tunnels. That and the fact that a fixed block signal relies on a slight current going through the running rails to detect trains, which means debris of the right materials can cause malfunction. A very common misconception, but the light bulbs are only the most visible part of a highly complex safety-critical system. Basically, the signal system is what ensures that trains don’t bump into one another at high speeds. Since it is safety-critical, it’s designed to be “fail safe” – that is, if a component stops working, the system assumes the worst. For example, if the component that detects the presence of a train fails, the signal system assumes that a train is present, and everything behind it stops. As a result of the complexity, signals are also very expensive, so they tend to stick around a long time. Some of the signals on the Flushing line date back to the 20s, and most of the IND still has its original signals from the 30s. Reliability suffers with age. And that’s why signal failures cause delays. I believe much of the 1/9 back-room signalling equipment dates from the original installation in the early 1900s, based on what I read after the 9/11 disaster. They have gotten to the point where they can’t replace parts because nobody makes them. My suggestion is to rebuild the “old, obsolete block signal system” with up-to-date equipment. This is cheaper and easier than experimenting with unproven hi-tech infernal machines whose reliability remains dubious. When properly maintained, the existing block system using the traditional three-color signals, would work very well. It did in the past when it was new and I can’t see why it wouldn’t work just as good if it was rebuilt to the original specifications.